Super Bowl 2013 will pit the NFC champion San Francisco 49ers against the AFC champion Baltimore Ravens. Super Bowl Sunday 2013 will take place at the Superdome in New Orleans, Louisiana on February 3rd. This year’s big game isn’t short on riveting storylines. One thing is for certain; a Harbaugh will be hoisting the Lombardi Trophy by the end of the night. Super Bowl Sunday 2013 has been dubbed by many as the “HarBowl,” as San Francisco head coach Jim Harbaugh will square off with Baltimore head coach John Harbaugh. It marks the first time in NFL history that the head men on opposing sidelines in the big game are brothers. This isn’t, however, the first time the brothers will lead their teams on the field against each other. On Thanksgiving night in 2011, John and the Ravens got the best of Jim and the 49ers in Baltimore, 16-6. Super Bowl Sunday 2013 will mark the end of a career that includes 13 Pro Bowl selections, 10 All-Pro selections and two NFL Defensive Player of the Year awards. Lewis also won Most Valuable Player honors when the Ravens beat the New York Giants in Super Bowl XXXV. In Week 10 of the regular season, San Francisco starting quarterback Alex Smith suffered a concussion that opened the door for second-year signal-caller Colin Kaepernick. Kaepernick made his first NFL start in a 32-7 trouncing of the Bears on “Monday Night Football” on November 19th and has kept the job ever since. In his first playoff game, Kaepernick set an NFL record for rushing yards by a quarterback in any game with 181 yards. Kaepernick then helped the Niners erase a 17-0 deficit and rally for a 28-24 win over the Falcons in the NFC Championship Game. On Super Bowl Sunday 2013, Kaepernick will join the likes of Hall of Famers Joe Montana and Steve Young as starting quarterbacks for the Niners in the big game. On Super Bowl Sunday 2013, the 49ers will look to match the Pittsburgh Steelers in all-time Super Bowl wins. San Francisco is a perfect 5-0 in its previous trips to the title game. Baltimore is making only its second Super Bowl appearance. The Ravens were victorious in their only other trip in 2001. The Niners and Ravens have only met three times since 2001. Baltimore has won all three meetings. Super Bowl Sunday 2013 will be considered by some to be a national holiday. Millions of Americans will host parties and gatherings around the nation. 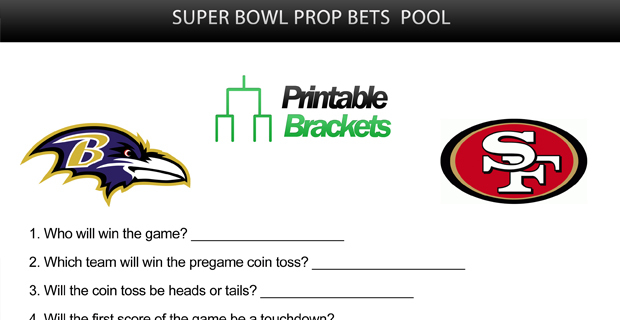 Super Bowl squares and Super Bowl prop bets contests are popular additions to any party. 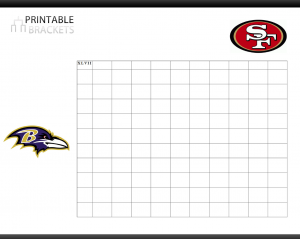 Printable Brackets has released a special Super Bowl squares template featuring the logos of the combatants in this year’s big game. This template, as well as a prop bets contest, is completely complimentary.